Conjugated Bilirubin is a better indicator than total Bilirubin during the resolving phase of hepatic and cholestatic disorders. 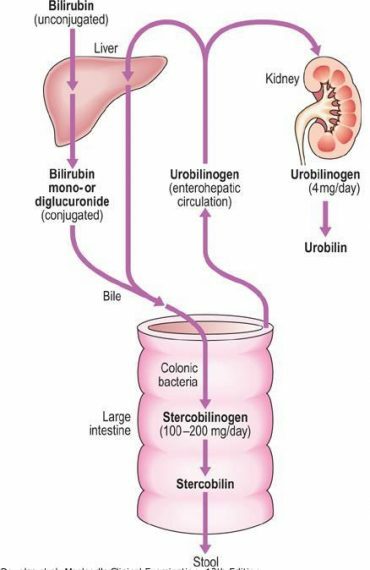 Unconjugated Bilirubin forms almost all of the total Bilirubin in hepatocellular failure (e.g. Hepatitis) or in Gilbert’s disease (an asymptomatic congenital disorder found in 3% of the population). In the conjugated state it can pass in the urine and is found in obstructive jaundice and toxic damage to liver. It may appear in hepatitis before jaundice and is also useful in following the course of infective hepatitis. increased in conditions that have an elevated serum conjugated Bilirubin.